It wasn't easy to read "Summer of the Gypsy Moths" while living with an 11-year-old whose first literary love was the "Clementine" series, also written by Sara Pennypacker. The third time I retrieved my copy from my daughter's bedroom - a tween lair crammed with bobblehead turtles, Tootsie Roll-scented lip balms and shells from every beach she's ever visited - I realized this book was the first of my literary possessions she's ever truly coveted. And with good reason: Pennypacker is a -Beverly Cleary-caliber girl-whisperer; she can weave a yarn both funny and touching, with all the beloved, timeworn themes at the ready: friendship, family, loyalty, loss and independence. In "Summer of the Gypsy Moths," we meet Stella and Angel, 12-year-old polar opposites (or so they think) who are living with Stella's great-aunt Louise, caretaker of the Linger Longer Cottage Colony on Cape Cod. Stella, who craves the orderly life instilled by "Hints From Heloise" columns, lands there after being abandoned repeatedly by her flaky mother; Angel is an orphaned foster child with a prickly attitude and a penchant for mournful Portuguese fado ballads. When Louise dies suddenly, the girls come up with a cockamamie scheme to bury her in the backyard so they can manage the cottages for the summer themselves, collecting tips from renters. They assume (incorrectly, it turns out) that Stella and her mother stand to inherit the house, so their plan is to dodge foster care by concealing Louise's death until the absentee mom returns from California or Mexico or wherever she is. Adult readers may need to suspend disbelief in the viability of this plot; for children, however, the setup is a triumph of freedom and ingenuity - the country-mouse version of E. L. Konigsburg's "From the Mixed-Up Files of Mrs. Basil E. Frankweiler." In that story, Claudia and Jamie fish coins out of the fountains at the Metropolitan Museum of Art and outsmart security guards by standing on toilets at closing time; in this variation, Stella and Angel dig for clams when they're hungry and stave off concern from George Nickerson, owner of the Linger Longer cottages, by pretending Louise is sick. Or that she broke her foot, or that she's out with her boyfriend. Oh, and that suspicious mound in the middle of the garden? Just pumpkins. Even when they're bickering like biddies, these two make a crafty team. In Pennypacker's island world, where Stella and Angel's grim, grown-up problems are juxtaposed against the backdrop of their tenants' sunny beach vacations, logistics are not the point; connection is. Stella looks out over the cottages from her bedroom window, having just dined on tomato soup while the families next door grill hamburgers and roast marshmallows. Her loneliness is heartbreaking: "An emptiness welled up inside me. It felt like hunger, but it wasn't in my stomach." You can't help rooting for these industrious hoteliers as they slowly turn away from the crutches helping them limp along - Stella's collection of household hints and Angel's music and never-ending supply of Dum-Dum lollipops - and toward each other. They set up a baby-sitting service; they frolic with sea gulls; they try to fend off an infestation of caterpillars in blueberry bushes planted 20 years earlier by Stella's mom. Once the girls form a united front, everything gets easier. Stella even learns to trust George, who gently articulates the book's most important theme while examining a shattered sand dollar left behind in the cottage called Tern: "See, broken things always have a story, don't they?" She also learns that appearances are not always what they seem. The carefree teenagers on the beach might look at her and think she's just another kid with her nose in a book: "They'd never suspect the secret I was hiding. I looked up and down the beach and wondered if maybe everyone could be hiding some big secret. I sank into the warm sand, smiling at the idea of a beach full of people, tied together by their secret-hiding." Although not everybody lives happily ever after (rest in peace, Louise), there is still plenty of joy to go around. Change comes as a result of sheer girl power and gumption. By the time the blueberries ripen, the girls have sprung themselves from their Charlie Brown-style universe, where adults appear only on the periphery and are largely useless. Their caretakers may not be the people you expect, but they are the ones Stella and Angel wisely choose for themselves. Elisabeth Egan, a former books editor at Self magazine, is now an editor at Amazon. Summer of the Gypsy Moths - Received a *STARRED REVIEW* in the January 15th issue of Kirkus. 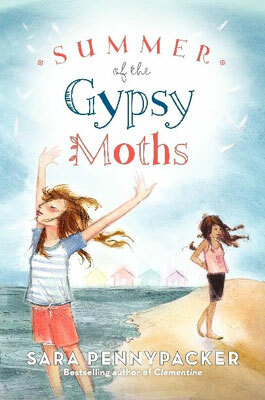 Susan Capaldi, children's book consultant at Between the Covers in Harbor Springs, Mich., shares her enthusiasm for Sara Pennypacker's Summer of the Gypsy Moths, a May release from Balzer + Bray. When I heard that Sara Pennypacker had a new book being published, I immediately thought, "Great! An entertaining summer read. Who better creates spunky and unforgettable characters?" Well, Summer of the Gypsy Moths delivers spunky and unforgettable characters-and much, much more. Pennypacker is a brilliant storyteller, weaving together people and place, dreams and heartaches, secrets and connections. The story of tweens Stella and Angel unfolds with humor in the midst of tragic events that allow an unlikely friendship to blossom. Ever-optimistic Stella has moved in with her great-aunt Louise, who lives on Cape Cod and manages four identical vacation cottages. Louise is a salty yet loving woman who also has taken in foster child Angel in hopes the girls will become friends. Instead, the two are like oil and water. Stella thrives on routine and can quote just about any of Heloise's helpful hints. She is eternally hopeful that her irresponsible and fragile mother will return to live with them. Angel, orphaned and guarded, feigns a tough exterior, yet is starving for comfort and a home. When Louise suddenly dies, the girls must depend on each other. Determined to survive, they form a bond and make some unusual decisions, including keeping Louise's death a secret and maintaining the cottages themselves. "All broken things have a story," says George, a kind neighbor who befriends the girls. And Pennypacker's novel is a wonderfully told story. This is the perfect book for fans of Sarah Weeks, Katherine Hannigan, and Jeanne Birdsall. Gr 4-6 - Ever since the death of her beloved grandmother, 11-year-old Stella has battled to maintain a sense of stability, to "clutch hold" to the spinning Earth. She explains that an unknown father and a terminally irresponsible mother have made her "personal gravity" "a little weak" and left her feeling rootless. Her anxiety is just beginning to lessen now that she shares a Cape Cod home with her taciturn Great-Aunt Louise and a foster girl named Angel whom Stella considers like "cactus...all spines." Pennypacker beautifully illuminates Stella's physical experience with vivid, unfussy prose, allowing readers to feel her nervousness and longing and her vigorous commitment to cleanliness and order (she even identifies a folder of hints from Heloise as her most precious possession). When Louise dies suddenly, Stella and Angel secretly bury the body in order to stay in her house, managing the vacation cottage colony next door and surviving on tourists' leftovers, in hopes of buying time for each girl's desired caregiver to provide a suitable home. The book effectively evokes the gritty, sun-bleached textures and salt breezes of its seaside setting, a vacation like contrast to the strenuous, desperate independence of the two girls. The understanding and emotional bond that grows between them develops with believable fluctuations and a light touch, as does the suspense of how long two kids can continue alone without being caught or getting a ride to the grocery store. There is a rich tradition of stories in which resourceful children make a home for themselves without (or despite) the adults around them. Sara Pennypacker makes a touching contribution to the field with "Summer of the Gypsy Moths" (Balzer + Bray, 275 pages, $15.99). Like Pippi Longstocking, the two 11-year-olds at the heart of this novel for readers ages 8 to 13 have no one to brush their hair or feed them properly when their guardian abruptly cannot care for them. Like the runaways in E.L. Konigsburg's "From the Mixed-Up Files of Mrs. Basil E. Frankweiler" (1967), Stella and Angel discover that they can hide in plain sight, fooling the grown-ups they encounter and avoiding being sent to foster care. And like the heroine of Julie Andrews Edwards's "Mandy" (1971), the girls' longing for a true home manifests itself in a determination to coax some straggly plants back to health. Here the setting is a string of vacation cottages on Cape Cod, the plants are blueberry bushes threatened by devouring caterpillars, and Stella and Angel, who have been thrown together for the summer, begin by detesting each other. When circumstance and the shared pain of abandonment conspire to make the girls work together, they find that they are surprisingly compatible and independent. Even so, children should not be alone, and it is weepingly happy at the end when, as in all the best orphan books, these two brave hearts find the place they have yearned for most. New York Times Book Review: "Pennypacker is a -Beverly Cleary-caliber girl-whisperer; she can weave a yarn both funny and touching, with all the beloved, timeworn themes at the ready: friendship, family, loyalty, loss and independence." Publishers Weekly: "...Pennypacker's novel is a wonderfully told story. This is the perfect book for fans of Sarah Weeks, Katherine Hannigan, and Jeanne Birdsall." School Library Journal: "Pennypacker's marvelously tactile writing animates [the] narration and brings both engaging, resilient, and resourceful characters to life."